Family UNplanning challenges current thinking and encourages Christians to put aside the master plan for their lives and look to the Master to plan their families. We hope that your hearts will be opened to God's truth on this matter and that you would join us on the adventure of a lifetime. Family UNplanning has Scripture on almost every page and is designed to bring honor and glory to Him alone. 5. How did we get to where we are today? 7. What are we afraid of? 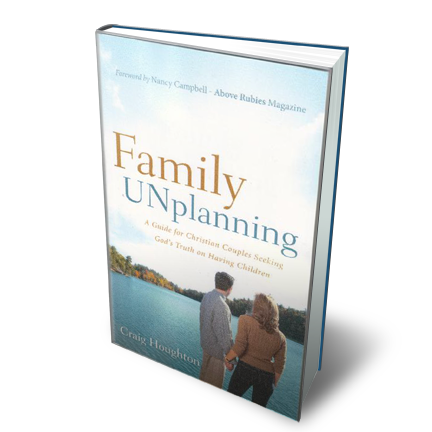 Nancy Campbell wrote a beautiful foreword to Family UNplanning. I am very grateful for her encouragement and contribution. Rick Boyer of The Learning Parent also took time out of his busy life to read and endorse Family UNplanning with this strong call to Christians in a back-cover review. Many thanks to Rick. "Craig Houghton has done all serious Christians a service by adding his thoughtful voice to the renewed discussion of contraception. In this day of me-first thinking, when children are often rejected as an inconvenience, Craig has called us back to Biblical basics with a clear echo of that authoritative voice that said, "Be fruitful and multiply." That was God's command to the first parents and He has never rescinded it. And though the modern church has largely forgotten its family priorities in the stampede to be "relevant" (which usually means mimicking the pagan society around us), Craig represents a new groundswell of Christian thought that seeks to return the family to the place of social prominence for which God designed it. Family UNplanning is a clarion call for a return to Biblical thinking in regards to God's most important social unit, the family." Click the button below to add the Family UNplanning to your wish list.